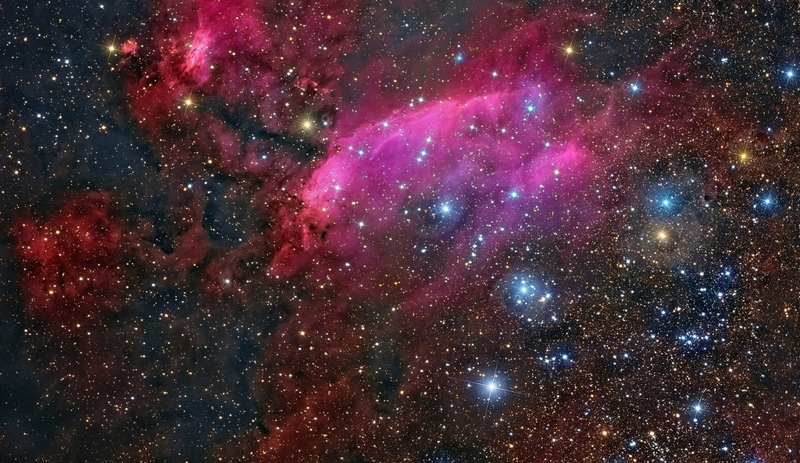 Explanation: South of Antares, in the tail of the nebula-rich constellation Scorpius, lies emission nebula IC 4628. Nearby hot, massive stars, millions of years young, irradiate the nebula with invisible ultraviolet light, stripping electrons from atoms. The electrons eventually recombine with the atoms to produce the visible nebular glow, dominated by the red emission of hydrogen. At an estimated distance of 6,000 light-years, the region shown is about 250 light-years across, spanning over three full moons on the sky. The nebula is also catalogued as Gum 56 for Australian astronomer Colin Stanley Gum, but seafood-loving astronomers might know this cosmic cloud as the Prawn Nebula. The tantalizing colour image is a new astronomical composition using data from the European Southern Observatory's wide field OmegaCAM and amateur images made under dark skies on the Canary Island of Tenerife.